Shaquille O’Neal practiced with the team today and he will be ready to play Wednesday when the team travel to Detroit to face the Pistons. O’Neal missed five games after he injured his shoulder when he tried to block a dunk by Miami’s Michael Beasley. 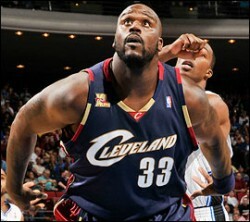 Shaquille asked for cortisone injection but the team refused and gave him time off and rehabilitation instead. “You can tell it’s a great organization,” O’Neal said. “I was cursing and screaming and trying to make them shoot me up, but they wouldn’t do it.” Shaquille said.